It makes the holiday feel even more exotic and worthwhile. Danes particularly relish in travelling to hot countries knowing that the summer in their own country will be a complete wash out. A recent survey showed that almost half admit that they enjoy their travels a lot more when the weather back home is bad. It’s one thing to simply see a forecast, but another altogether to feel it on your own body. Giving beach goers a first-hand insight, Spies Travel agency invited them to improve their vacation and truly experience their local weather with a chillingly clever experiential campaign. 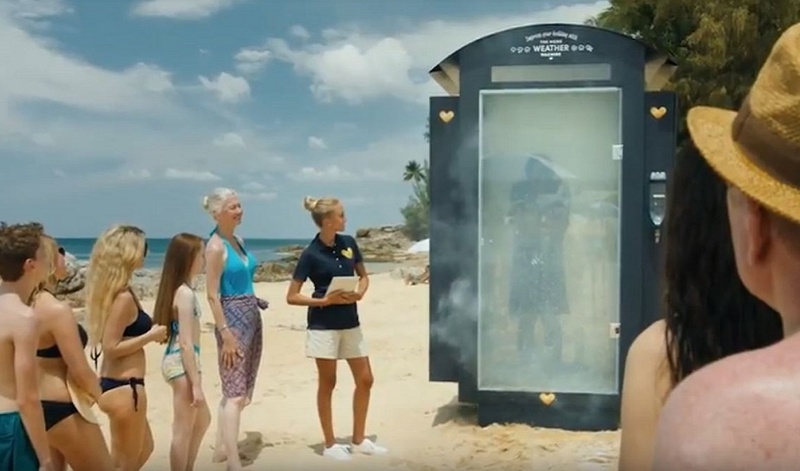 The Danish travel company brought a unique pop-up simulator, known as the home weather machine, to an idyllic beach in Thailand. Delighted and surprised travellers simply entered the name of their town before stepping into the machine, which then replicated their actual home climate using real-time data from an online forecasting service. The conditions varied from rain and wind, to storms, fog and even snow. They also added a little extra rainwater all the way from Denmark to make the experience even more authentic. When stepping back into the hot, tropical climes of Thailand, participants could appreciate their holiday even more and enjoy the self-satisfaction that comes with knowing they’ve escaped terrible weather in their own country. The imaginative and interactive outdoor activation reminded beach-goers just how lucky they were to be on vacation, and not back home in the cold. The agency’s message was to ultimately inspire people to book their next trip so they too can escape a poor summer and luxuriate on a hot sunny beach somewhere. What makes this campaign meaningful and memorable is by not just showing people their local forecast but by giving them a first-hand experience. It’s fun, inventive and would certainly get people talking. This campaign could have been even more impactful with an additional digital element to involve people at home too. This would have increased shareability online and given the campaign a wider reach. While trends come and go, the weather will always remain a hot topic. Whether you live in a hot or cold country, we’re never quite satisfied with what we have. It’s why many brands have capitalised on the seasons to capture the hearts of consumers with timely, effective campaigns. Previously, drinks brand 7UP helped satisfy people’s thirsts with an inspiring twitter-driven sampling campaign in Brazil and car maker Toyota delivered a very clever weather challenge prank on forecasters to promote a new car with a sunroof.